Nellie Freeman in action at the 2012 NLBFR. "How I got my nickname is a pretty good story," explains Danielle "Nellie" Freeman of Eckert, Colo. She continues, "When I was about 6-months-old, Aunt Jody sent a card that ended with, 'Tell little Nell I love her.'" I've been Nellie ever since. Two and half years later, the name game got even better for Freeman. "Then when I was three," she explains, "My favorite girl at school was named Danielle. I'd choose this name for myself when I was playing. When I found out that was my actual name — I was pretty excited!" Freeman and her parents, John and Kim, and younger sister Courtney, live on Colorado's Western Slope. "We have a couple acres and an arena," says Nellie. "I go to school at Cedaredge High School, which is about five minutes from our house." She describes Eckert as having, "… a church and a Big E store and a new candy store." Nellie's a freshman this year and plays on the school's volleyball and basketball teams. She is also considering running track or playing soccer in the spring. Basketball season is just getting started and volleyball season just ended. "Our C team only lost two games and the JV won more than it lost," Nellie explains. Freeman's favorite classes are PE and weights. Her favorite subject is Math. "I'm taking both Algebra and Geometry this year," she adds. "Math comes kind of natural to me, so that makes it nice." At this time last season Freeman was trying to decide where to focus her efforts. She enjoys playing many sports and had decided basketball was her favorite for a while. "I didn't rodeo much in the middle of the season last year," she explains. "I was loving playing basketball, so I didn't rodeo much at all." The time she spent in the gym limited her opportunities to practice rodeo during the winter. With the change of seasons, however, came a change for heart for Nellie. "I went to the first National Little Britches Rodeo Association (NLBRA) rodeo of the summer and realized that I didn't really like basketball more than rodeo. I was just crazy, I guess." With this realization, Freeman went to work in an effort to make up for lost time. After that first rodeo, she was excited to get back to the practice pen and spend some quality time with her horses Jackpot, Breezy and Rocky. Nellie considers Jackpot, "The best goat horse ever." She goes on, "He's 21- or 22-years-old now, so I won't be using him much anymore. I've done everything on him though. Last season I used him for breakaway, trail and goats. In both 2010 and 2011 we placed second in the world in the trail course in the NLBRA." Breezy is the most recent addition to the family, and Jackpot's replacement. The horse is Freeman's new favorite. "She's 16-years-old," says Nellie. "I'll miss the old horse but I just love Breezy. She's still learning but tries her hardest every time." The pair are still getting used to each other and repetition is the current routine. "We're making a ton of trail course runs right now," Nellie explains. "I want to make her automatic. I'm also practicing some get-offs for goats on her." Goat tying practice is known for producing some high-speed crashes, but Nellie and Breezy have not teamed up for any so far. According to Freeman, "I haven't gone very fast with her yet. I'm kind of a chicken." The horse she's able to go pretty fast on is Rocky, her pole and barrel racing partner. "I just love him," she says. "He's 16-years-old and I have to get after him sometimes because he can be a little lazy. He can also be ornery at the gate, but after we get going he's just fine." The family is rounded out by two additional members, Cinch and Chunky. Cinch is an Australian Shepherd and the first pet Nellie can remember. According to her, "She was my first dog ever. She's very pretty and the best dog in the world." Then there's Chunky … "He's a Jackawawa," explains Freeman. She goes on, "Lots of rodeo families have them. Some are tall and skinny and some are medium. Chunky is small and fat. My friends call him Meatloaf. He thinks he's the biggest dog ever and makes messes in the house. We can't get mad at him though, mostly because he has the saddest eyes ever when he gets in trouble." Sadness was something Nellie didn't have to contend with much during the National Little Britches Finals Rodeo (NLBFR) in Pueblo, Colo., July 23-28. 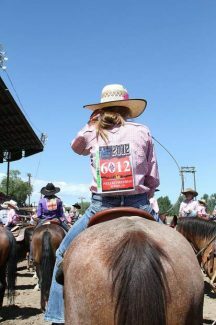 While she didn't enter the week with all the points she desired, she made up for it at the season finale — earning the 2012 NLBRA Junior Girls Reserve All-Around Cowgirl buckles for both the finals and the season. "I had a decent summer and actually won all-around saddles at LBR rodeos in Craig and Cedaredge," she begins. Nellie continues, "Even with this, I didn't make it to nationals with many points in the pole bending. I did enter the rodeo maxed out in the goat tying though." There were some surprises in store for Freeman at the finals. She competed in every event in her age group but the team roping and found success in events she had struggled with prior and experienced setbacks in events she's proven successful in the past. "I struggled in barrel racing at the finals," admits Nellie. In the breakaway roping, however, she finished among the best 25 cowgirls in the world. "I caught a calf, which was a surprise," she says. Another top 25 result was earned in the ribbon roping. Nellie describes her contribution to the team this way … "When it comes to this event, I'm definitely the runner." A fifth place finish was added in the goat tying, and Freeman ended the finals sixth in the trail course. This was in spite of what she describes as less than stellar short go-round performances in both events. 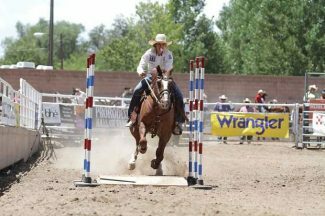 Her best finish at the rodeo was in pole bending, where she has traditionally been more toward the middle of the pack. 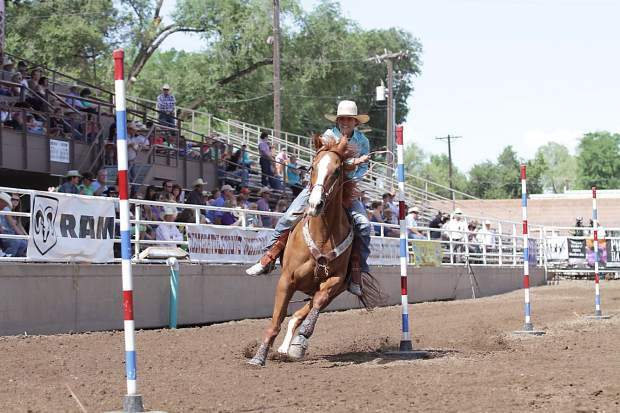 Three 20 second runs in Pueblo boosted her to fourth place for the week. Freeman ponders this for a moment and says, "I don't know where that came from." What Nellie does know is that the support of others has been the key to her rise to the top of the youth rodeo world. "My mom and dad support me always," Nellie says. 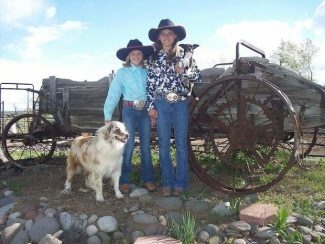 John and Kim's involvement with Little Britches Rodeo extends beyond their children. John serves as a judge at many rodeos, including the NLBFR, and Kim is the rodeo secretary for the Garfield County LBR series held in Rifle, Colo.
Another source of support is Grandma Lynne. "Grandma comes to every rodeo," explains Freeman. "Mom and Dad are often busy with their secretary and judging duties, so my grandma helps out saddling and unsaddling horses, keeping track of our points and everything else." Lynne lives close by, which has always been handy. According to Nellie, "When I was little and got mad, I used to 'run away' to Grandma's house on my bike." Freeman is quick to acknowledge other members of her extended rodeo family for roles they have played in her success. "I've spent a lot of time with Hayden and Quincy Segelke. Hayden inspired me to tie goats better. I spent a week with the family once just to practice with her and Quincy. We tied about a hundred goats a day while I was there. It was hard and we were sweating like crazy, but I got better." Practice sessions like this will definitely make you better. The mental toughness that comes with this level of commitment can make you the best. 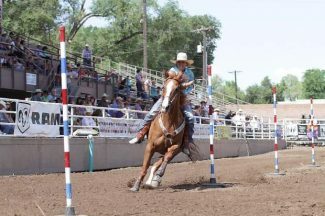 A good example is the fact Hayden, who now attends Northeastern Junior College (NJC) in Sterling, Colo., was crowned the 2012 National All-Around Champion Cowgirl for the National Intercollegiate Rodeo Association (NIRA) — as only a freshman. Nellie explains that she and Quincy remain good friends even though they live far apart. The Freemans will still occasionally stay at the Segelke's place when they travel to visit family in Kansas, and as Nellie recalls from not too long ago, "Quincy and I used to send each other letters before e-mail became so popular." Freeman's goals for the 2013 season include breaking in the new horse — with a focus on goat tying and the trail course. She also wants to continue to improve her barrel racing and pole bending times. 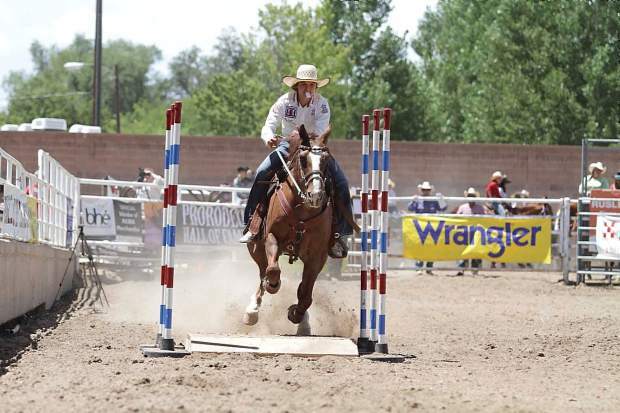 In regard to breakaway roping, she adds, "I'll continue to practice and hope for the best." Nellie moves to the Senior Girls division this year and understands she must continue to improve to stay competitive at the next level. When asked what she sees as the difference between the divisions, Freeman summarizes, "The times are not a lot different, but the consistency is. To win in the Seniors you have to make fewer mistakes. At the finals, you'll have to be fast in all three rounds to win."